Bordered by Switzerland and France, Valle d’Aosta is Italy’s smallest region, both in scale and population. Despite its diminutive size, the highest mountains in Europe lie within its territory (Mont Blanc, Cervino, Gran Paradiso and Mont Rosa). It was these mountains that drew Rome to capture Valle d’Aosta from its original inhabitants, the Celts and Ligurians, in order to create a pass through the range. However, the extreme weather of the region kept most invaders at bay, allowing for a largely autonomous existence for the population. Though several kingdoms controlled Valle d’Aosta at various times, leaving behind many remarkable castles, the region maintained its independence and was granted official autonomy in 1948. 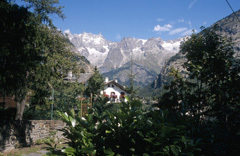 It is no surprise that Valle d’Aosta is renowned for the skiing found on the peaks of the Matterhorn and Mont Blanc. The resort towns of Cervinia and Courmayeur are popular destinations; Cervinia is positioned at the foot of the Matterhorn, allowing skiers to share the slopes of Zermatt, Switzerland as well. The lush, green valleys and mountains of the region are also wonderful spots for hiking in the warmer months. For those looking for a less strenuous but equally entertaining experience, Valle d’Aosta is home to Europe’s largest casino, located at the heart of the lovely and charming town of Saint Vincent. The regional cuisine is unique, hearty and eclectic, influenced by neighboring France and by local produce. Many dishes utilize locally made Fontina cheese and are paired with one of the wonderful local vintages, such as Nus Russo, Blanc de Morgex or Chambave Rosso. While Valle d’Aosta may be best known for its small size, the impact of this varied and stunning region is large. Nicknamed “Rome of the Alps”, Aosta is located at the heart of the Aosta Valley and is the largest city in Valle d’Aosta. Named Augusta Praetoria for Emperor Augustus, the original walls surrounding the Roman fort-town are still present today and are one of its many architectural features. 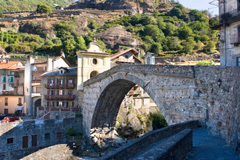 Settled first by the Gauls, who surrendered the town to the Romans in 25 BC, Aosta became the capital of the Alpes Graie (Gray Alps) province and home to the Emperor’s troops, making it a prime target for invaders. Despite the marauding attackers, the center of the town, where cars are still forbidden, remains true to the original Roman grid street pattern and is a reminder of the historical significance of the area. After the collapse of the Roman Empire, Aosta fell to the Ostrogoths, the Byzantines and to the Lombards before joining the Kingdom of Italy. One of the most notable landmarks in Aosta is the Arch of Augustus, which was built to honor the city’s namesake and was originally the entryway to the town. The Aosta Cathedral was built in the 4th century and renovated in the 11th century and combines Romanesque style with a neoclassical façade. The central piazza is huge and is home to the Caffe Nazionale, a historic café that opened for business in 1886 on the site of an ancient church. Along with such striking ruins as the Roman Forum, the Amphitheater and the Roman Theater, 20 travertine towers built between the 12th and 17th centuries still stand throughout Aosta, several of which are open to explore, including the Tour Fromage (Cheese Tower), which is frequently used for art exhibits. The city also plays host to a hugely popular regional event; the Bataille des Reines, a heifer head-butting contest, is held every October in the Croix Noire Stadium and is a spectacle worth seeing. The Fair of Saint Orso, a legendary saint from the region, is a renowned art and music festival that takes place every January and has been celebrated for well over a thousand years. Whether exploring the well-preserved vestiges of the Roman era or enjoying the local shops and entertainment, Aosta is a delightful surprise. While incredible skiing comes to mind when Courmayeur is mentioned, the town’s natural hot springs were the initial draw of this mountain town, dating back to the 17th century when it was a popular spa. Today the resort area offers some of the best skiing on the highest peak in Europe, Mont Blanc, as well as a glimpse at a charming, traditional and historic town. The narrow cobblestone streets lined with cafes, shops and restaurants beckon and can rival the pull of the slopes. With ease of access from Milan, France and Switzerland, the area has become a favorite spot for skiers and outdoor enthusiasts, and the offerings of the town’s local haunts reflect the international visitors who come to shop and play. Discotheques and high-end boutiques as well as pizzerias and pubs are scattered throughout the quaint town. Despite the fame of the slopes, Courmayeur and Mont Blanc can be enjoyed year-round, as well as for those who are interested in sightseeing, not risk-taking. The Mont Blanc cable car runs from La Palud, a nearby village, and takes passengers up the initial phase of the mountain to Mont Fréty, where a meal and wine can be enjoyed along with the scenery. There are several hiking trails as well as Europe’s highest botanical garden, the Giardino Botanico Alpino Saussurea (or Saussurea Botanical Garden), which is home to over 800 plant species. Two more cable cars finish the ascent on the Italian side of the mountain and spectacular views abound. For adventure seekers, mountain guides can be arranged to lead a trek across the Mont Blanc glacier. In the summer months, it’s possible to continue into France to the panoramic Mont Blanc gondola, which takes riders directly over the remarkable glacier into Chamonix, France where a bus returns visitors to Courmayeur. From fantastic snow and an even more fantastic après-ski scene to fabulous shopping and spectacular views, Courmayeur is a year-round resort destination that lives up to its reputation. Pont-Saint-Martin up the valley, which becomes steadily narrower. Beyond Donnaz (322m/1,063ft) the massive Fort Bard (391m/1,290ft; 11th century) stands on a hill on the right. (Local Name: Galleria del Monte Bianco) The construction of the Mont Blanc Tunnel (Galleria del Monte Bianco; boring completed 1962; opened to traffic July 16th 1965) is very important, particularly for tourist traffic. The tunnel begins at Entrèves (altitude 1,381m/4,557ft) above sea-level, and ends 11.6km/7.25mi farther on at an altitude of 1,274m/4,204ft above the hamlet of Les Pèlerins, a suburb of Chamonix. The tunnel (toll), which is open throughout the year, shortens the journey from Italy to western Switzerland and central and northern France by several hundred kilometers during the period from October to June when the high Alpine passes are closed. (Local Name: Monte Bianco) Mont Blanc (in Italian: Monte Bianco, 4,810m/15,873ft), the highest peak in the Alps, over which the Italian-French frontier runs was first climbed in 1786 by Jacques Balmat of Chamonix and the village doctor, Michel Paccard; then in 1787 again by the Geneva scientist Horace-Bénédict de Saussure, accompanied by Balmat and 16 porters. The best starting point for the climb (10-12 hours, with guide) is Les Houches, a village 10km/6mi southwest of Chamonix. Beyond Chaptillon the Aosta valley road affords open views of the fertile valley and the mountains around Aosta, with the three-peaked Rutor in the background. Farther on, above the mouth of the Val de Clavalité or Val de Fénis, in which the snowy peak of the Tersiva can be seen, stands the mighty castle of Fénis on the left (1330, with later additions) with a beautiful courtyard (15th century) and wall paintings; inside there are 15th century frescoes. Bianche (2,823m/9,316ft), to the Plateau Rosà (3,480m/11,484ft). 1km/0.75mi north of the Plateau Rosà is the Theodul pass (3,322m/10,963ft), from which there are fine views, extending also into the Zermatt valley. This purpose-built Italian resort offers skiers the opportunity to ski Zermatt without paying Swiss prices. Il Cervino is the Italian name for the Matterhorn and Cervinia is the village at its base where Mussolini proposed a ski resort be built. A hodge podge of architectural styles, Cervinia offers beginners and intermediates wide open slopes with good uncomplicated cruising. 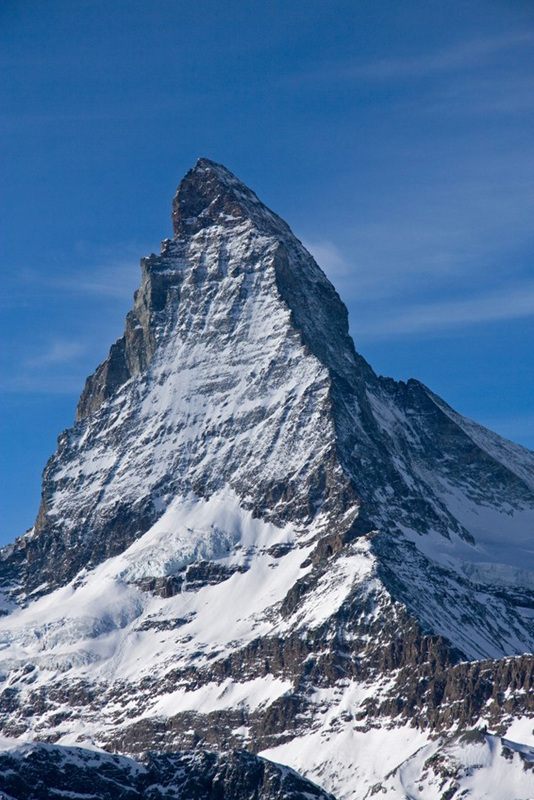 If you plan to ski to Zermatt from Plateau Rosa (now served from Cervinia by a 140-passenger cable car), be sure to buy special lift tickets for use on the Swiss side first or you’ll be paying more for a lift ticket on the other side to get back to Italy. The Swiss side offers steeper terrain and narrower trails for advanced intermediates and experts. Arnad (412m/1,360ft) has a ruined castle high above it (634m/2,092ft); beyond this, on the right bank of the Dora, is the castle of Issogne, built in 1480, with an interesting interior. Local Name: Parco Nazionale del Gran Paradiso) Cogne is a good base for climbing expeditions, particularly in the fascinating Gran Paradiso National Park (Parco Nazionale de Gran Paradiso; 600 sq.km/231 sq.mi; perimeter 180km/112mi; many ibexes and other animals), which occupies the northern part of the Graian Alps.